When I first tried reviewing a manga series, it was a bit of a challenge. But, I did at least know I wanted to give more manga a shot and review much more of them. Cut to this past spring when I was given the request to review a manga series I had never heard of before. It’s a bit longer than Solinen was, but that’s ok because who doesn’t love reading sometimes? +Anima is a 10 volume Adventure/Fantasy series written by Natsumi Mukai and published by MediaWorks in Japan. The manga ran in Dengeki Comic Gao! from January 2001 to March 2005. As of this review the manga is licensed in Australia thanks to Madman Entertainment and in North America by Tokyopop… However, the likelihood of finding it in the states is slim since Tokyopop kinda went under a several years ago…. And may possibly be making a come back… Who knows. In the country of Astaria, some humans have an unusual gift that grants them the ability to morph one or more of their body parts, such as limbs, into a form of an animal's body part. Some are capable of even more radical changes, such as growing wings or full-body transformation. The transformation processes are very fast, and occur at the user's will. When inactive, the morphed areas revert to normal, leaving the person's clothing and body completely untouched. The only visual mark of this ability appears on the body of the person, in the form of a black birthmark that determines an individuals’s anima. Occasionally, the user bears some behavioral characteristics of their animal, but this is not very common. +Anima are not treated kindly by the "normal" humans. Therefore, when some are treated bad enough or have a taken over neglected feeling, their anima often takes over them. 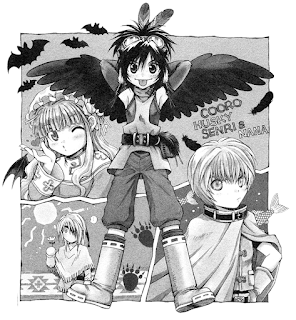 This story revolves around four +Anima children: Cooro, Husky, Senri, and Nana. Brought together by their +Anima powers, they search for others like themselves and a place to belong. Along the way, they encounter villains and friends alike, as well as other +Anima. If we were going to classify the art style used for +Anima, it would fall more in line with the typical Shoujo style based on the character designs. It also makes sense to classify it here as the men that are drawn in this manga are either rather adorable, beautiful, or attractive. At least this is the case for Cooro, Husky, and Senri. While the character designs are simple, there are moments where the art exemplify their features as well as the backgrounds and scenes, helping to set the tone and give the different locals some bit of an exotic look to them. During those times, the art style can become absolutely beautiful! During the off times, it may cut corners in order to keep a decent look within the limited budget and schedule. Luckily, it does use those moments for the sake of comedy and doesn’t use it for some of those really lovely looking moments. Because that would just look really off compared to the rest of the manga. The story is rather simplistic and easy to get through, with several larger arcs as well as small one off stories placed in as filler in order to give some breathing room. With the use of a journey in order to progress the story along, our four main characters get to meet and interact with many different individuals varying from human to +Anima and with several backgrounds such as military and slave. What makes the story the most interesting is learning and understanding the world created and what kind of laws or ethics are involved. One minute, we’re meeting a military man looking to make an agreement with an +Anima tribe, of sorts, and the next we encounter a town where a woman runs the show and her daughter is rather controlling when it comes to her friends. While meeting these different people and hear their many stories, we also learn more about +Anima themselves. How they came to be and what it is that causes them to be this way. While the many stories do grab interest in one way or another, sadly there is a small problem of lack of explanation. I’ll explain a little bit more when I discuss Cooro, but there are parts of the story that don’t seem to be fully developed. Plot threads seem unfinished or in some need of further development while others may seem a little rushed at times. This can cause some missing story elements by the end of the series that seem to be swept under the rug or rushed in order to try and make sure there are little to no loss ends. It’s a little saddening because the world building and story were rather good. It just might have suffered from lack of popularity for it to be cancelled. At least, that’s what I hope it is and not the manga author being lazy cause that would be a crying shame. The development of the characters of +Anima is rather mixed. For our four main characters, it ranges from quick one off exposition, such as it was for Nana, to several chapters in a current arc that give more story to them, such as Husky and Senri. For Nana, the very quick exposition dump during her initial introduction ends up turning her into a one note character. She never really grows or develops as the story progresses, remaining unchanged by the end. In some ways, this is a good thing as Nana’s story is among the least complex out of the major characters. However, this also keeps her personality consistent and resulting in it being rather flat and annoying at times, causing her character to be the weakest among the main four. 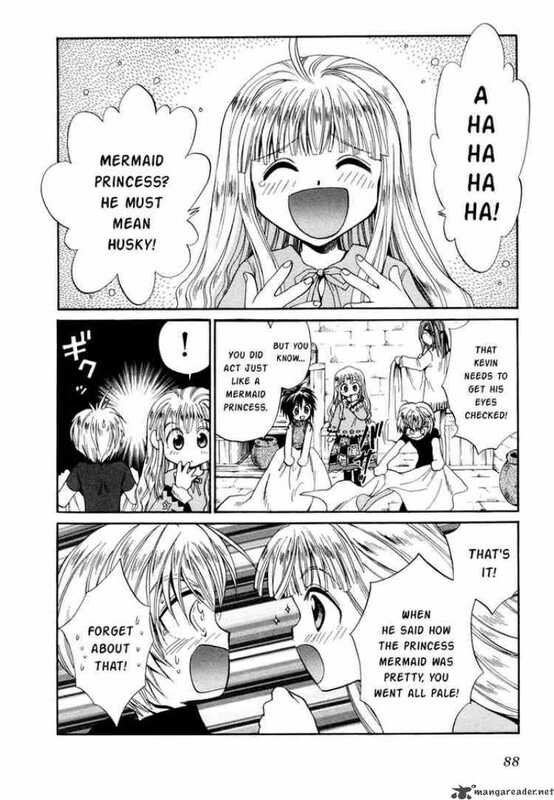 Husky is also rather consistent throughout the story. While we do learn much more about him and his upbringing, we also get small changes in his character over time. 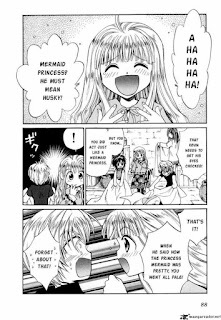 For example, from the beginning, we see that Husky isn’t all that fond of being around girls, including Nana, finding them annoying to deal with. We’re lead to believe that maybe Husky is scared of girls or he’s just having one of those growing pains where he finds girls icky or something. When it comes time to learn more about Husky, there’s actually a more interesting reason for this, despite it being a little bit silly. Senri is a slight mix of Husky and Nana. 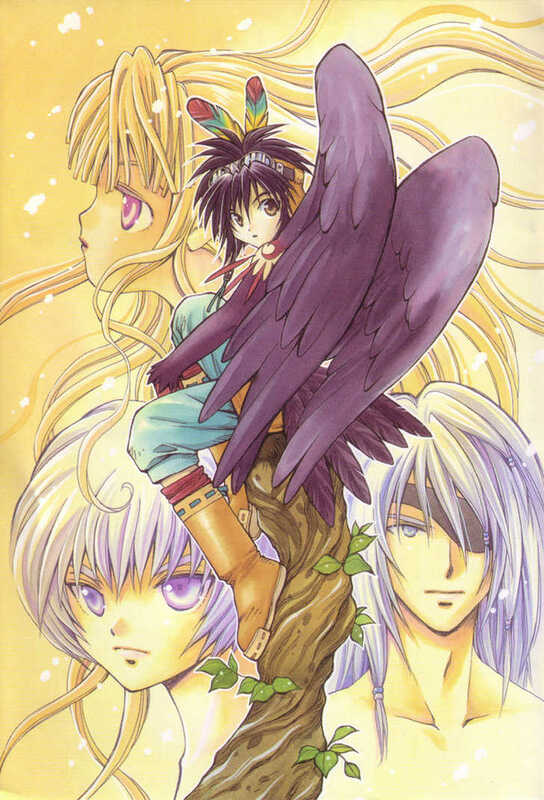 While Senri does get an arc in the story where his past comes into play, like Husky, he doesn’t really develop any further than what we had previously seen, like Nana. 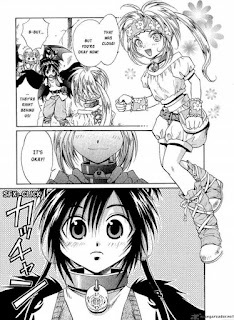 While it makes Senri’s personality more one note, the back story makes him a drastically more interesting character compared to both Nana and Husky. Part of this has to do with his heritage, but part of it also has to do with Senri’s past itself. As for the main lead, Cooro, his development is a little odd. 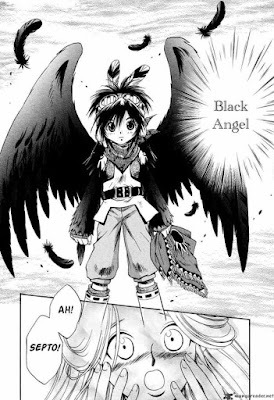 Throughout the manga, he remains rather consistent in personality while remaining an utter mystery as the only +Anima child to have been born as an +Anima. While the final chapters of the manga do explain this and give a proper story to him, the explanation in the end didn’t truly conclude his development and story. Almost as if Mukai was almost out of panels and needed to wrap up the manga. While this may not seem like an issue to some, for others it may result in the build up towards the most mysterious character of them all turning into something rather underwhelming in the end. By the end of the journey, +Anima builds an interesting world for itself and gives perspective on the many sides it contains. The ethical and moral themes are there along with some interesting ideals and philosophies using a simplistic art style to coincide with it. However, some parts of the story could use a bit more development or closure while some characters could have used some extra development themselves or a not so rushed arc that leaves you a little disappointed. 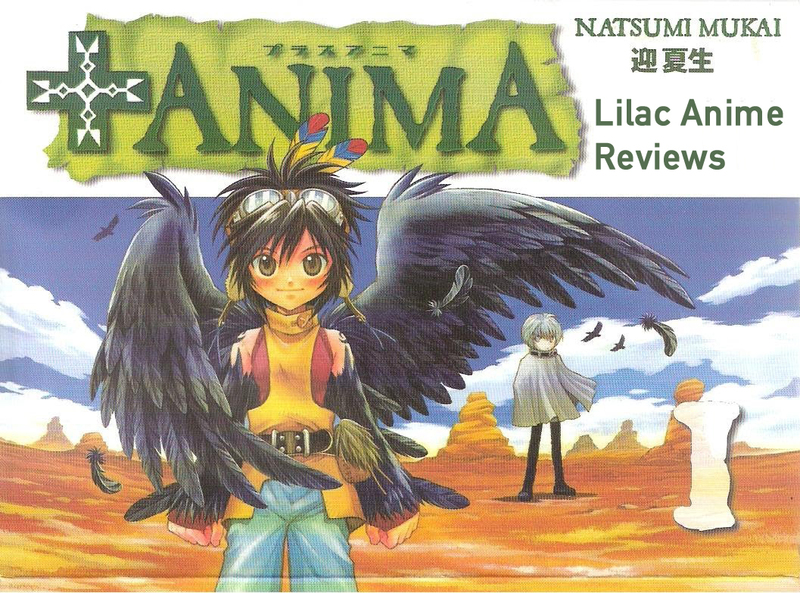 Whatever your decision, +Anima still has an interesting story and style to it that it will make those ten volumes seem like nothing at all! It’s at least rather different than what I’ve read before. Special thanks to Zenithwillrule for this request! Next time, things get a little supernatural with a Himegami. Until then, otaku on my friends. Final Rating: 6/10 - A great premise that takes small missteps, but still executes well!